At the campsite, you can enjoy the indoor heated pool. You can also relax next to the pool in the solarium. Even young children can have fun in the wading pool. They can also play in the playground designed just for them. 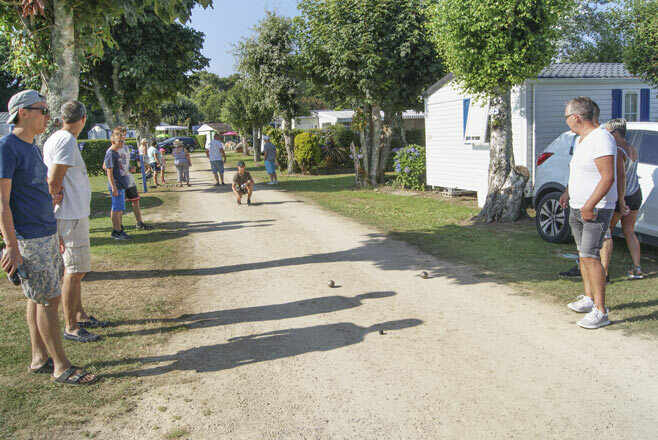 The Kerleyou Campsite provides you with a petanque court, as well as ping-pong and foosball tables. You can borrow board games, bowling balls and pins and petanque boules. Every week, we invite you to come together for a meal (French fries, sardines) for a moment of conviviality and sharing. – Sail boats, windsurfing boards, catamarans, kayaks, private lessons. Outings, boat rides, sailing cruises, lessons. Half-day or full day. Sorties, balades en mer, croisières en voilier, stage. A la ½ journée et à la journée. Expositions temporaires et permanente + visite de bateau à quai.